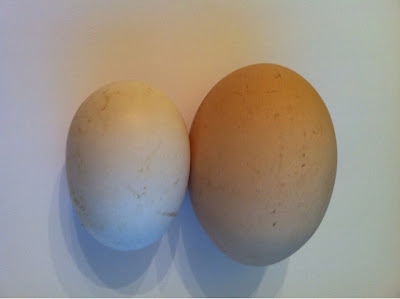 These are two of the eggs that I had to take out of the incubator. The one on the left is a bantam (small) egg and the one on the right is a large fowl egg (Coronation Sussex). Can you look at the pictures and tell why you think they might have died in the shell? Both of these had blood rings which means they were developing but died for some reason. Can you guess why? the eggs are looking good cause i want to know when are they going to hatch becuase my mom wanted to know becuase they are so ciute i love the eggs are they ours cuase if they are they would of been hatch cuase you told us that our would hatch allready ! love brianna!